with this motto Kathmandu Jazz Conservatory (KJC) has been actively connecting people from Nepal and abroad since 2007. Being one of the pioneer professional music institution catering a comprehensive curriculum allowing the students to choose from among a variety of courses including applied lessons in various instruments, music arranging, improvisation, jazz and Hindustani music theory and history, ear training, midi instruction, studio recording are few subjects not offered elsewhere in Nepal. KJC has been able to meet its goal all these six years of time frame by recruiting national and international musicians together with workshops from renowned musicians to groom the students equally the faculty for productive outcomes in days ahead. KJC have the only Aebersold Jazz Practice Room in South Asia, donated directly by Mr. Jamey Aebersold, the Jazz Educator. KJC has already supported more than 50 students for proper music education and career in music through its KJC Scholarship Fund started from 2008 with support from Hyatt Regency Kathmandu, Women in Concert, Davis Project for Peace Grant, Jamey Abersold and individual donors and supporters. Celebrating 5th year anniversary KJC started Nepal Music Education Festival (NMEF) last year bridging the cultural interaction among people of different nations in many forms. NMEF has brought together diverse talents and energies of quality musicians from around the world and within Nepal to acquire international music education in a fairly reasonable price for Nepali Musicians. More than 90 participants participated in the workshops, lectures, teachers training program, performances, and interaction programs last year and targets to achieve more this year inviting international music educators like Mariano Abello, Natalia Calderón, Juan Ortiz, Paul Pax, Bob Sands and national music educator Rajat Rai. 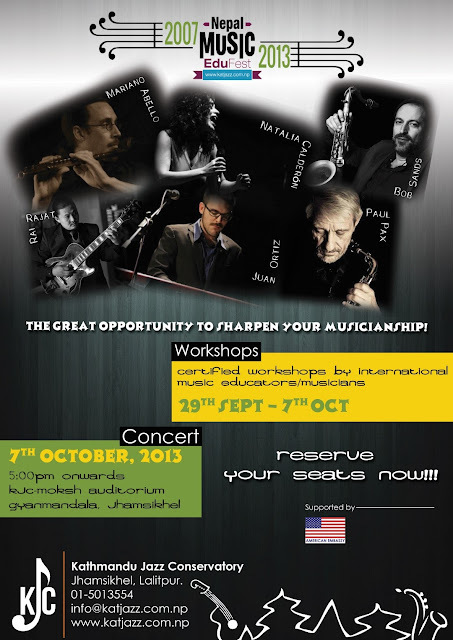 This year NMEF starts 28th September with a major focus on instrument workshops, combos, rhythm section and choir as full package for participants together with lectures, teachers training and interaction program leading to a performance day on 7th October at Moksh Auditorium at the KJC premises. An audition is planned for 28th September, 2013 | Saturday at the Kathmandu Jazz Conservatory premises located in Jhamsikhel, Lalipur. Through this audition placement of students are categorized to their levels of music knowledge from beginners to intermediate level. All the participants will be appreciated with certificate for their full participation at the performance day while the participation fees are reasonable. KJC has opened registrations and an early bird registration before 15th September, 2013 will only cost you NRs.7000/- while post the mid September will cost NRs.9000/- for full package (Both the cost inclusive of the registration charges). This year KJC has even made ease for some participants who might not be able to join the full package but join the separate classes of choir and instrument workshops which are mandatory and which will cost NRs 500/- per class per subject. The second NMEF will also support deserving participants through its KJC Scholarship Fund. While, teachers training program only open for teachers will cost Rs.1500/- starting 28th September itself to be conducted 8am - 9am at the KJC premises. 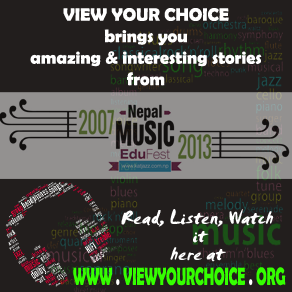 View Your Choice- तपाईको सोचाई हाम्रो रोजाई is one the key supporters of Nepal Music Education Festival 2013 as last year's KJC Music Edu Fest 2012. It will bring you more stories in days ahead. Keep on subscribing us as well as follow us on our social media's.